Agriculture Secretary Tom Vilsack today announced the winners of the MyPlate Fruits and Veggies Video Challenge. Dozens of contestants demonstrated innovative ways to "make half your plate fruits and vegetables" with skits, songs, and dance submitted via video to USDA. Each video provided a unique point of view to inspire adults and children to eat healthier and illustrated that fruits and vegetables can be a part of any household budget. Schools, community groups, and families shared insightful, practical tips to include fruits and vegetables in every meal and snack. In addition to the winning submissions, USDA selected 5 videos for honorable mention. All of these videos capture the spirit of the Fruits and Veggies Challenge and are featured on ChooseMyPlate.gov "
In September, USDA encouraged individuals and teams to submit inspiring and instructive videos that provide innovative, easy, and practical tips on how to "make half your plate fruits and vegetables." Each award winning video features one easy to apply tip and directs viewers the website. USDA received 142 submissions in three categories: Tips for Kids; Tips When Eating at Home; and Tips When Eating Away from Home. The Challenge awards $9,000 in prize money to 1st, 2nd, and Popular Vote winners. PROMOTING THE PLATE: USDA is dedicated to promoting a half-plate of fruits and veggies. Latest video contest shows new ways to get that done. 1st Place: On the Go Snack Boxes – You can always have a healthy option by creating these easy to make snack boxes to put in your backpack. A busy student shares how she and her mom wash and cut up a variety of fruits and veggies and store them in individual snack boxes. A great tip for older kids on the go! 2nd Place: Let's Get Involved - A fun way to get your children excited about fruits and vegetables is to get them involved in the shopping process. Encourage healthy eating habits by letting children select the fruits and vegetables they eat. Let your kids choose! Popular Choice: The Fruit and Veggie Pokey! – These students have a message for you! Listen as these students share their tips for eating more fruits and vegetables while they dance to the "Hokey, Pokey Song." 1st Place: Wrap Rap – A delicious and nutritious wrap is a great way to get more fruits and vegetables. A rapper provides us with an easy to remember "wrap" song to encourage us to make half our plates fruits and vegetables. 2nd Place: Eating fruits and veggies without straining your budget – Seasonal, local and grow-your-own options are all good ways to make half of your plate fruits and veggies. Watch this young student as he provides some creative ways to stretch your dollar. Popular Choice: My Tip: "Think Vegetables First" - Planning a meal for your family? Mom shares how she changed the meals for her family. Think vegetables first when planning a meal and add the rest of the foods to complement the vegetables. 1st Place: Substitution and Replace...A story of Give and Take - A mom discovers her sons have been hiding junk food and avoiding more nutritional fruits and veggies. Through substitution and replacement her sons discover a healthier way to eat. 2nd Place: Pack Your Lunch Bag with Fruits and Veggies! - Here are some tips for workers/students on the go who wants to make sure they fill half their plate (or lunch bag) with fruits and veggies! It saves tons of money and calories! Popular Choice: Richmond Avenue Café – Kids can make "make half your plate fruits and vegetables" when they eat out, too! A young student applies what he learned in health class at the Richmond Avenue School about healthy eating. Amazing results happen when you eat healthy! MyPlate Tip: Eating More Fruits and Vegetables When You're Eating Away From Home –This animated couple "rock" their way through tips for eating at a restaurant. This video is based on the Tips for Eating Healthy When Eating Out tips sheet from the 10 tips Nutrition Education Series - and the song I Choose My Plate. Earthcare for Veggies - Growing your own garden is a rewarding, inexpensive and fun way to add variety to your diet with a wide array of fresh fruits and vegetables! All it takes is a small patch of land in your backyard, some sunlight, water and a little home grown appetite. Fruit Veggie Swag - Get your fruit veggie swag on! Students perform a music video showcasing delicious and healthy ways you can enjoy fruits and vegetables. Young people share how fruits and vegetables--frozen, fresh or canned--are nutritious, and suggest affordable, fun, and tasty ways to prepare them. My Plate Tip - Put Kids in Charge (I Choose My Plate) – Let your kids choose the fruit they want to eat. An energetic preschooler shows us how he chooses his fruits and vegetables and offers a song to keep all of us mindful of MyPlate. This video is based on the Put Kids in Charge tips sheet from the 10 Tips Nutrition Education Series. Tips for Eating Healthy When You're On the Go - Want to eat healthy on the go? Plan ahead and pack your own healthy treats of fruits and veggies. You won't be tempted to buy sweets and fried snacks with these tips! Winning submissions will be available on the ChooseMyPlate.gov website and featured on partner websites. The MyPlate Fruits and Veggies Video Challenge was sponsored by the USDA Center for Nutrition Policy and Promotion. 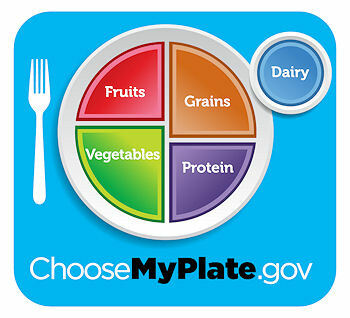 For more details on the video challenge, go to ChooseMyPlate.gov or fruitsandveggies.challenge.gov. Announcement of the winners comes as USDA highlights the second in a series of themed consumer messages supporting the MyPlate icon – Enjoy Your Food, But Eat Less – that USDA is promoting the next three months in conjunction with more than 5,000 organizations participating in the MyPlate Nutrition Communicators Network. Administered by the USDA Center for Nutrition Policy and Promotion, the MyPlate communications effort is a complement to First Lady Michelle Obama's Let's Move! initiative that is dedicated to solving the challenge of childhood obesity in a generation. USDA continues to support healthy food choices and recently released the new web nutrition tool, the SuperTracker. The SuperTracker is a comprehensive, state-of-the-art resource available at ChooseMyPlate.gov designed to assist individuals as they make changes in their life to reduce their risk of chronic disease and maintain a healthy weight.